It’s been so long since I posted anything, not for the first time this year – that I’m not sure where to start. 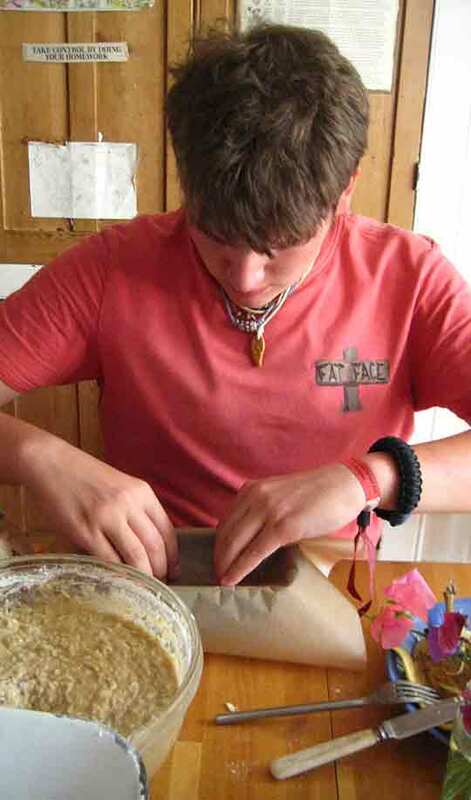 But it probably has to be with Arnau who discovered garlic bread while he was in England – not only discovered garlic bread, but was keen to learn how to make it too. 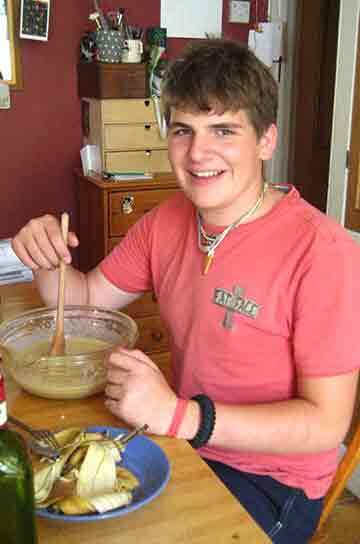 He was a little overshadowed by Vedran with his daily banana bread baking though, which was a pity. I promised that I would post this back in July – so Arnau, if you’re looking – sorry for the delay, but better late than never. 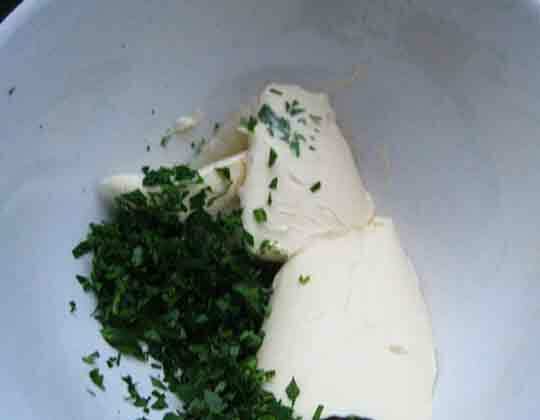 Garlic bread is fairly easy – chop the parsley and chop the garlic into very, very small bits, dollop the lot into a bowl with some butter and salt if the butter’s unsalted and mix well. 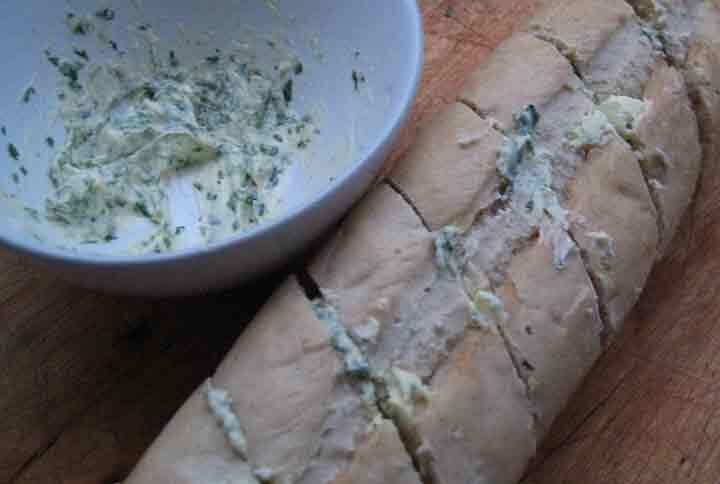 Then cut some diagonal slices not all the way through a baguette, fill the cuts with the garlic and parsley butter, wrap the lot in foil and bake for about 10 minutes in a very hot oven. 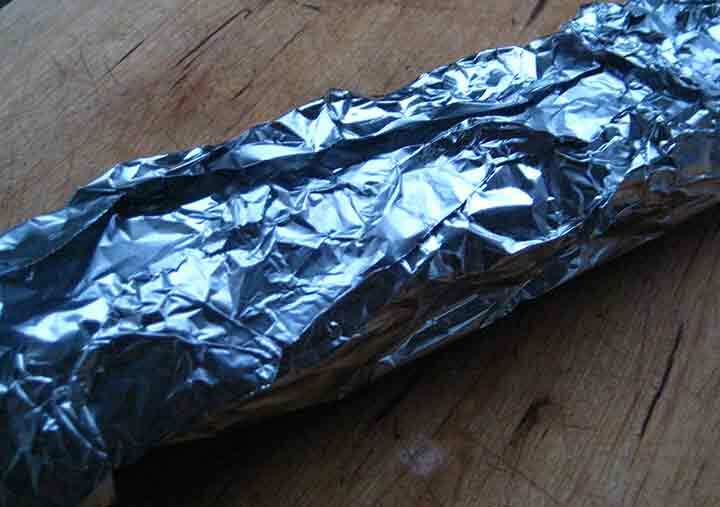 Usually I don’t bother with the foil, but for some reason I did this time – it does stop the butter from running all over the floor of the oven. 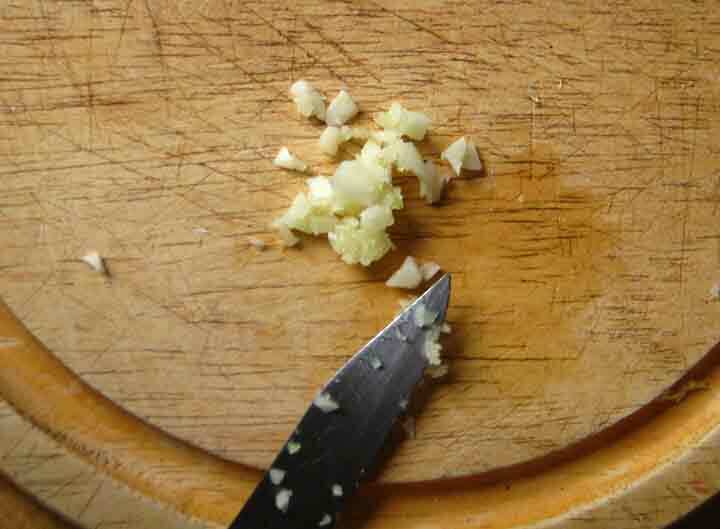 This principle works well with basil instead of parsley – add a thin slice of tomato to the basil and butter mixture in each cut. Delicious. At the moment the Aga is off because we are waiting for Richard to service it. We turned it off when we went to Spain for a holiday thinking that we wouldn’t be that cold when we got back and we ‘d be fine if it took a few days to get it back on again. Temperature is a funny thing. When you’re somewhere hot you can’t really imagine what it’s like to be cold, and when you’re somewhere cold you can’t really imagine what it’s like to be hot. Well you can, but it always falls short of the mark. And given that I know this, why did I imagine that we could live without the heat of Aga? Or its cooking powers? 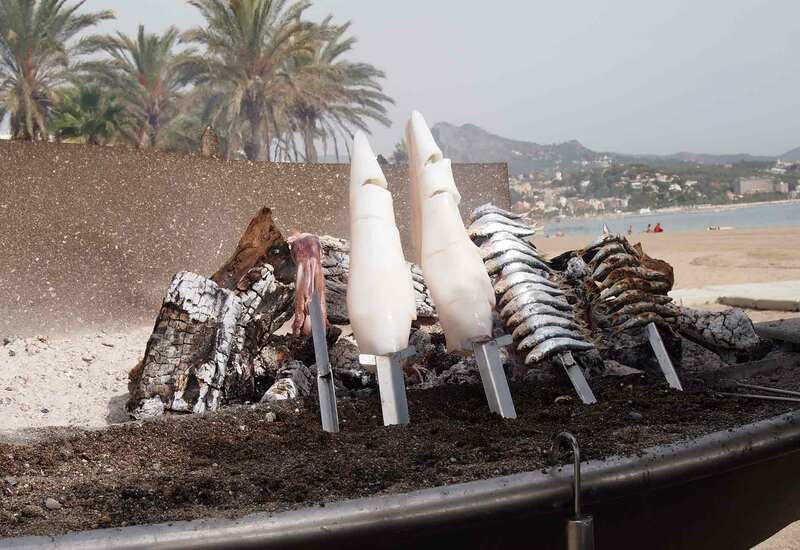 There’s nothing quite as delicious as a salt rubbed sardine (preferably more than one) cooked on a fire on the beach and eaten with some fresh bread and a squeeze of lemon, but you probably have to be in Malaga to really appreciate it – and not Devon. In the rain. Liza-Beth emailed me to express concern that I hadn’t written anything here for ages. She was a little worried, I think, but now she ‘knows that it’s just blog laziness rather than something serious, she’ll probably not email me again for ages. She is moving house though – and Kit is now 15 (happy belated birthday Kit) which is pretty scary. 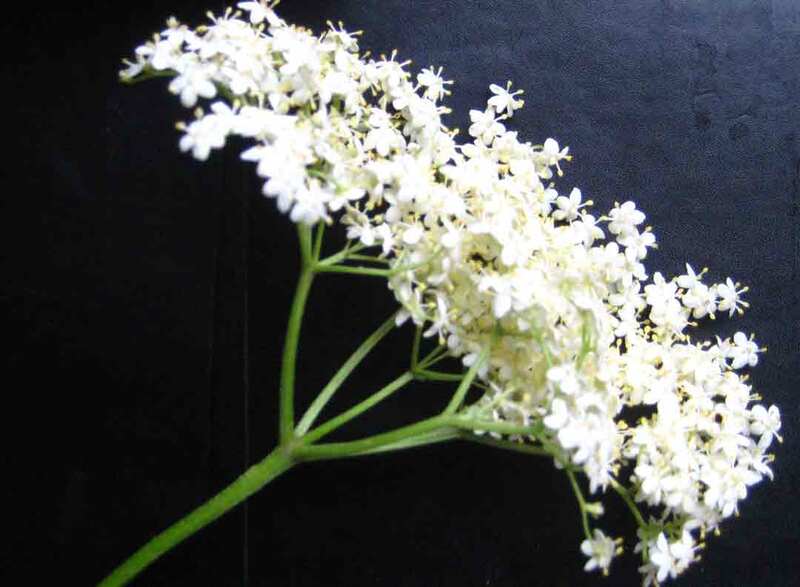 However, the elderflower is still out (just) and there might still be time to make nice things to drink – and write it down for posterity (with a picture of elderflowers and their leaves for Halo and Manf as they might poison themselves, and quite possibly other people, if I don’t). A cautionary note to anyone gathering elderflowers: they grow on a tree. Often quite a big tree. With tree like leaves and not lacy feathery leaves. At the moment there are all kinds of while lacy umbellifers out including hogweed, hemlock, hemlock water dropwort, but although they may be tall plants, they are not trees. They’re not good to eat either – poisonous in fact – and generally smell nasty. 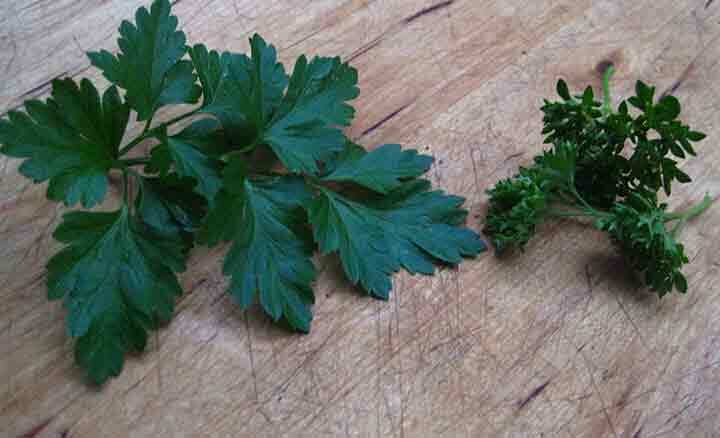 Halo and Manf gathered what they thought was elderlower a few weeks ago, but it turned out to be something quite different – cow parsley possibly or rough chervil. I was a little disappointed especially as Halo has had the benefit of my wild plant identification skills for most of her early life, but, like times tables, the knowledge didn’t stick. It has to be said that Halo wasn’t sure her harvest was the real thing, so I suppose that’s some comfort. The elderflower was early this year. 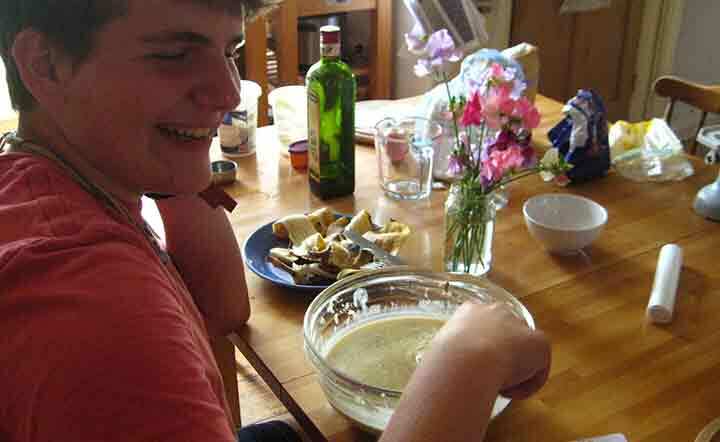 Usually I can make an instant elderflower drink (put two or three large heads of nice smelling elderflower heads to infuse in a couple of pints of water for an hour or so, strain, add the juice of half a small lemon so and then sweeten with a little sugar) for Rella’s birthday which is May 27th. This year I would have had time to make elderflower champagne by her birthday and this takes about three weeks (didn’t though – thought she’d be in Cardiff for her birthday so there wasn’t any point – and she was 21 too! sorry Rella!). As I said the elderflower’s early. Mild winter you see. It’s best to pick elderflower in the morning I think and before the sun has been shining on it for too long. Don’t pick near roads (pollution). You want heads that are yellower (rather than starkly white) because they have more pollen on them and more flavour. Once the flowers are picked don’t shake them too much, but leave them on a flat surface for a few minutes so that insects can crawl away. One thing I should mention is that before you pick any elderflower (or berries later in the year) you have to ask for permission from the elder tree witch. Don’t say I didn’t warn you. Elderflower champagne is nice and naturally fizzy. You need about 10 very large and nicely scented elderflower heads (or more if they’re smaller ones) which you put in a very clean container (scrupulously clean). Add gallon of cold water (about 4.5 litres). Add the juice and the rind of an unwaxed lemon, a pound and a half of sugar and a tablespoon of white wine vinegar. Swirl it around to dissolve the sugar, cover and leave overnight – 24 hours really. The next day strain the flowers off through a sieve lined with a sheet of kitchen paper towel (to catch the insects) then pour into clean strong bottles – pop bottles are good. Leave in a cool place for a week or so and it’ll start to ferment. Drink while it’s fizzy – it’s only very mildly alcoholic, but it’s early summer in a bottle. I’ve made several batches of cordial already and I may just make one more. 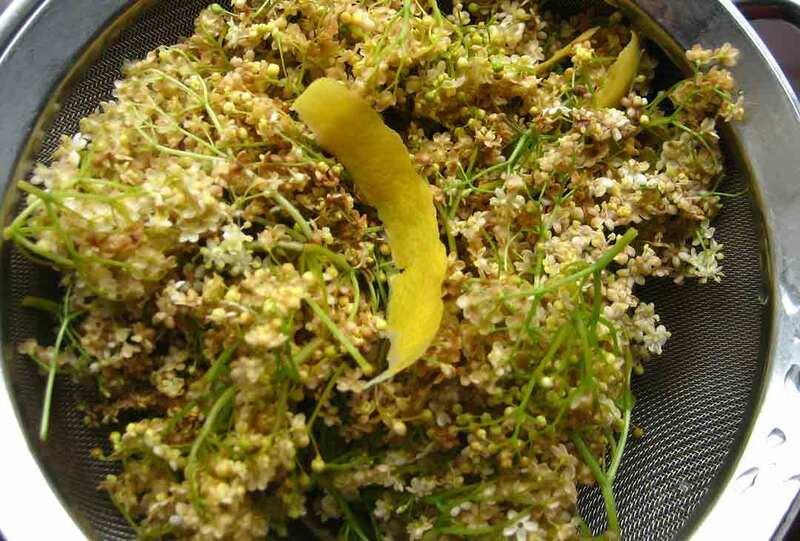 Put about 8 or 10 large elderflower heads in a suitable container, add 4 pints of cold water and the juice and rind of a large unwaxed lemon stir well, cover it and and steep it overnight. 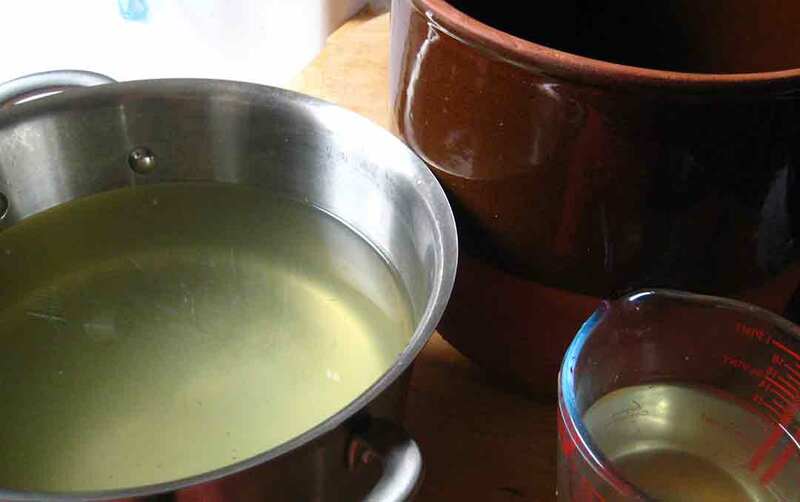 Next day strain off the flowers and the rind and pour the liquid into a pan (preferably not aluminium as that can make the elderflower taste funny) and heat the liquid. Add the sugar stirring all the time. It’s cordial so you will dilute it, but how much sugar you add is up to you really. If you want it to last for a long time you’ll need a pound (16oz) to a pint, but that makes it very sweet and when it’s diluted it loses some of the elderfloweryness. I tend to go for less sugar – usually 8oz ro a pint. It won’t keep as well, but I think elderflower probably shouldn’t. Once the sugar’s dissolved bring the cordial to a rolling boil and then remove from the heat, cool, bottle and drink diluted with fizzy water. Delicious. 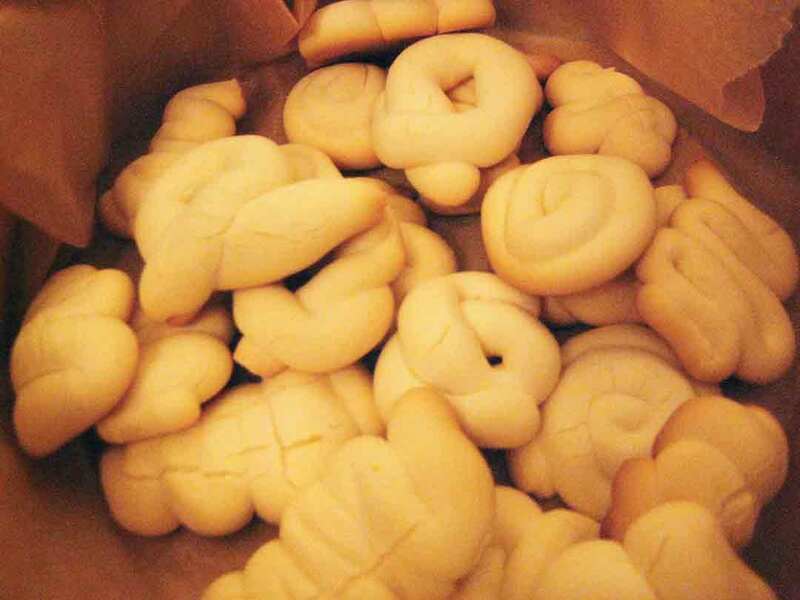 Today I made ai caramba biscuits with clotted cream, condensed milk and tapioca flour. It’s a variation on a theme. I used clotted cream because I’d bought some so that we could give the Spanish students staying with us a cream tea, but there was quite a bit left over. Ai caramba biscuits are definitely improved by the substitution of clotted cream for double cream. 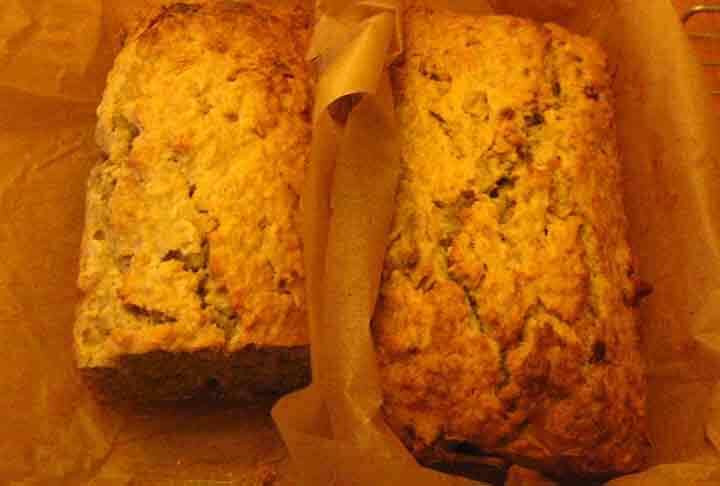 Simple to make, gluten free too. I’ve posted the recipe before, but you can’t have too much of a good thing – and because I tag my posts so badly, things are hard to find… I’m working on it though. So, make ai caramba biscuits by dolloping equal amounts of cream and condensed milk into a bowl – it’s a measurement by eye rather than by weight or volume. I think I had a couple of tablespoons of each. Add tapioca flour bit by bit until the mixture’s malleable (I like that word) and not sticky. The packet of flour I had was 250 grammes and I didn’t use it all. 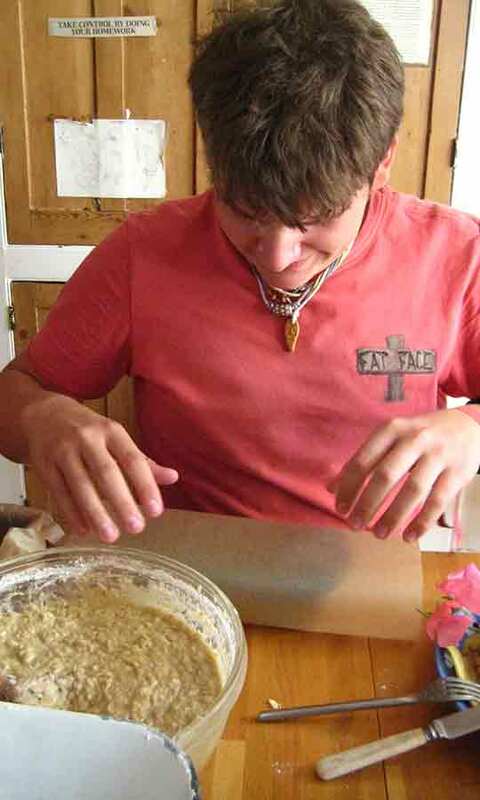 Roll with your hands and make thin snakes (no thicker than a cheap biro) and then roll them into circles, hearts, jumping jacks (firework reference), spirals – whatever looks good – and place on a lightly greased baking tray. Bake in a not too hot oven (180c?) until they are slightly risen and brown underneath, but not brown on top – 20 minutes? Cool on a wire tray. They have a pleasing snap when you bite into them and the texture’s very close and not at all British biscuit like. Nice with coffee. Nice to take on a picnic – though you’ll need something to drink with them. Take the Storm Kettle and make a brew? 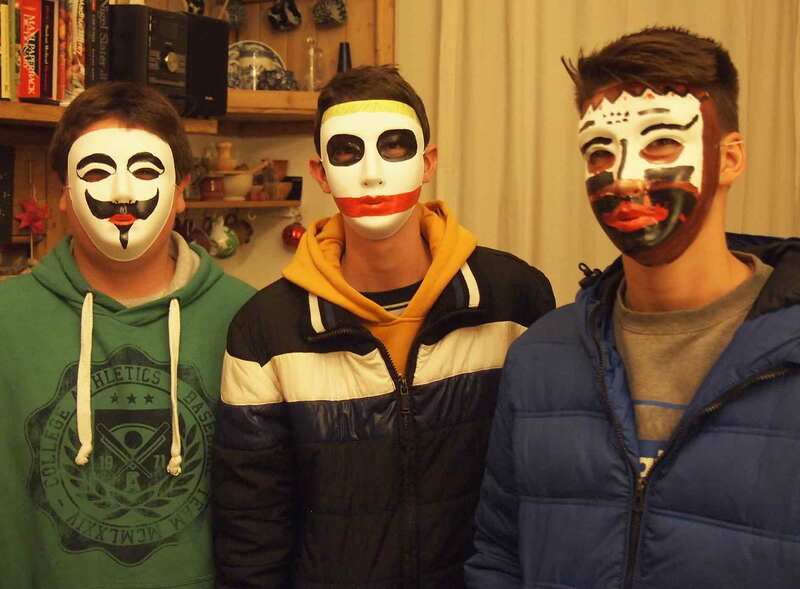 Here’s a picture of the language students who inspired the clotted cream just before they went to a masque disco on their last night. They look a bit scary. I’m not sure it was intentional. It’s Danny’s birthday today and he’s 20 – actually it was yesterday, Didn’t realise how late it was. Anyway – happy birthday Danny, (and happy birthday Brian – because it is his birthday today). It was half term here last week and the beloved and I decided to leave soggy Devon and visit Rella in Cardiff. We drove there and for the first time in weeks it didn’t rain. In fact the sun shone! It felt as if a great wet weight had been lifted. Cardiff was bathed in sunshine. We wandered the city marvelling at the architecture. The castle was looking spectacular, but it was a bit pricey to get in and we were on a budget – and although the weather was warm, it wasn’t quite warm enough to spend long enough in the castle to justify paying the entrance fee. So, even though it was sunny, the museum beckoned – mainly because the buildings were so impressive and covered in dragons. When you live in a small town, as we do, which has higgledy piggledy Elizabethan building nestling along the main street, you get easily impressed by the kind of grand architecture that capital cities boast. We thought we’d just pop in to the museum and see what it was like, but once through the door we got drawn right in and stayed for hours. There wasn’t anywhere near enough time to even scrape the surface – we’ll have to go back soon. It’s a good job Rella’s in her first year at university. If we’d been thinking we’d have made the most of the sunshine and headed out to the museum of Welsh rural life in St Fagans, or to Barri Island, or Penarth, because Wales is a lot like Devon when it comes to weather – two fine days in a row is unlikely. But instead we did those things in the rain the following day. There’s no helping some folk. St Fagan’s is fantastic even in the pouring rain and my mother tells me that in one of the cottages (the museum consists of a series of buildings – cottages, a mill, shops, a school – all representative of Welsh rural life) there’s an organ donated by her family (a musical instrument that is, rather than a kidney or something quietly rotting). Dinner was at Wagamamas in Cardiff Bay. Really nice. I had a prawn kare lomen which is an explosion of taste (coconut, lime, coriander with a hint of something I couldn’t identify) on a bed of ramen noodles. It looked really pretty as well. Forgot to take a photo which is a shame as it was a very photogenic meal and we were practically opposite the water as the sun was going down so the waterside was bathed in a pink glow. Have to go there again too. 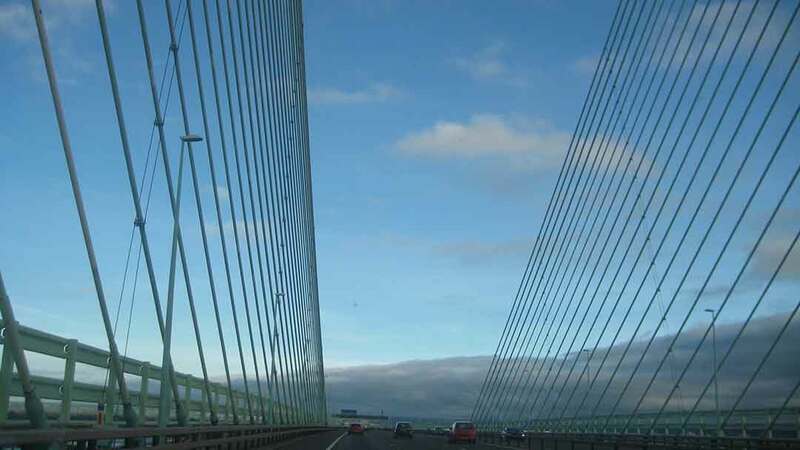 After a night in an Ibis budget hotel – not as bad as you might think , and quite fun for a 12 year old who got to sleep in a top bunk above his parents’ bed- we headed out along the coast to Penarth. 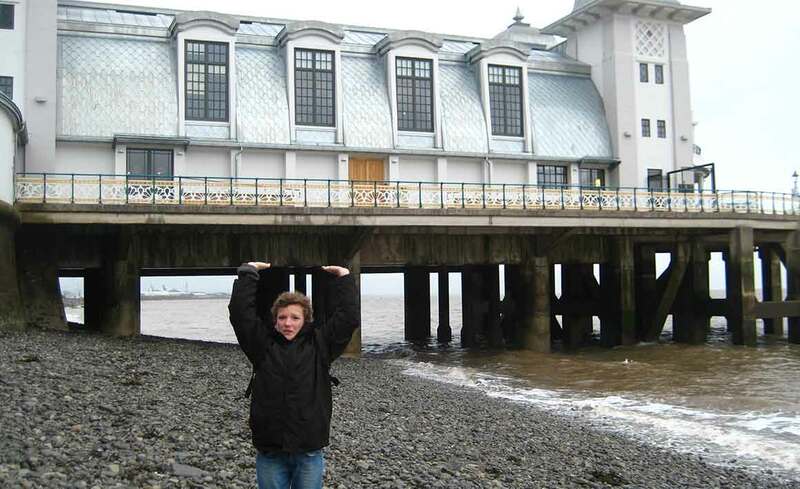 I took a photo of Arlo holding up Penarth Pier – fantastic pier – no amusements or rubbish, just a very reasonable cafe, lovely exhibition space and a cinema. Windy though. It reminded me a bit of Southwold pier, but without Tim Hunkin’s rather good games. When we finally made it back to Devon, the bananas in the fruit bowl were smelling very bananary. The whole kitchen smelled of banana. This time I tried baking them. I wasn’t sure it was going to work. 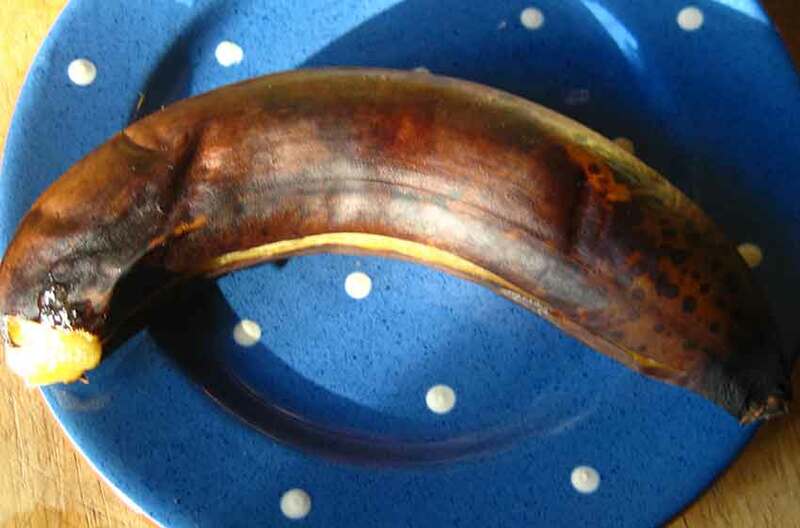 I didn’t think I liked cooked bananas, but they were OK when Katrine barbecued them way back – they were good in fact – and I hate to waste food. Arlo is a bananaphobe, so he wasn’t interested and the beloved was busy finding something savoury to eat, but I slung a banana into the aga for me. The aga was very hot as no one had cooked on it for a couple of days so the banana cooked quickly. 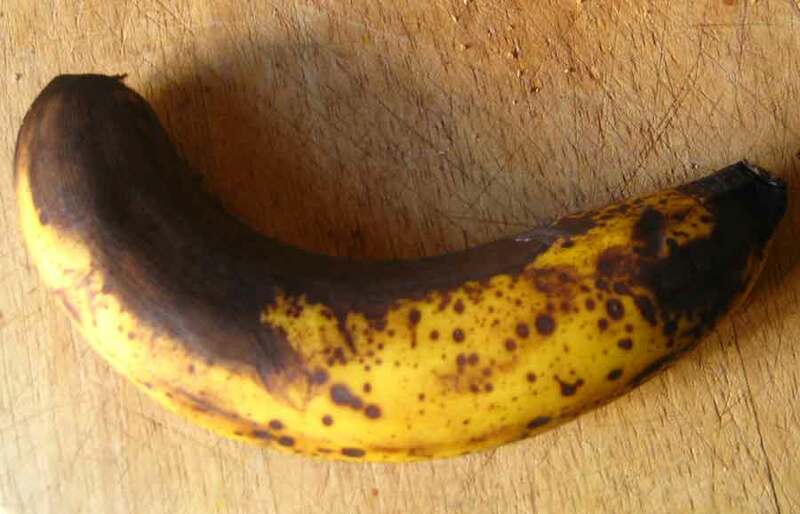 It looked brown and speckled when it went in and came out a scant 10 minutes later puffed up and brown – the skin split, which isn’t really the aim as you get banana all over the oven (unless you put it in a baking dish. I didn’t). 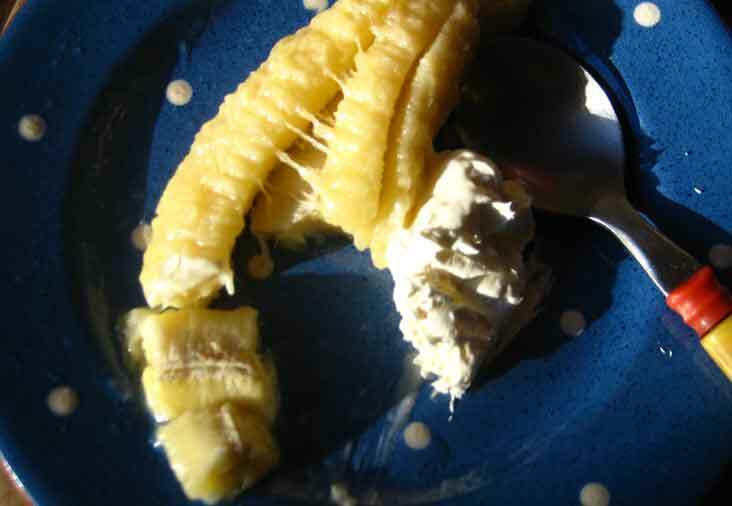 Then all you have to do is carefully peel the banana and then dollop some yogurt on and eat. I’m making a concerted effort to draw something every day into a drawing book this year. I usually do draw every day, but it’s usually things like birthday cards (happy birthday John) or illustration on a shopping list, or something that I’m working on. So far I’ve achieved my goal, but it is only January 13th. (I’ve posted some of the drawings on my other blog which you can see here). This drawing I thought I put on this blog because it’s food related. Loosely. Very loosely. 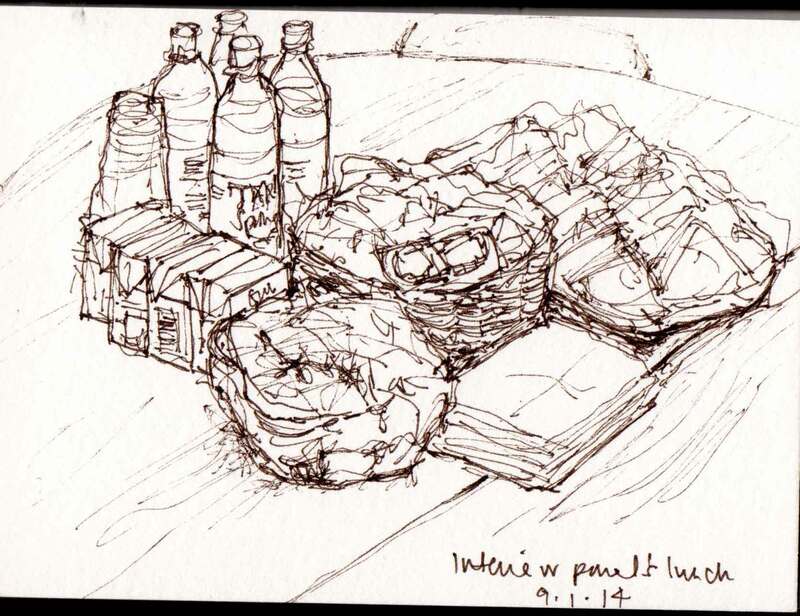 This is a drawing of the lunch that was provided for the interview panel I was sitting on. Jane said “You can wait in my room. Lunch has been provided”. There was a look on her face I couldn’t read. I went into the room and on the table, resplendent in cling film was lunch. I didn’t dare undress it, I just drew it. Later we carried out the unveiling. There were sandwiches: sliced bread, whitish – they were OK ( I was hungry), but egg and tomato really is an unlovely combination; tuna and cucumber, and cheese and cucumber are both too predictable. I think there was ham and tomato, but I don’t eat ham. There was also a bowl of crisp type things – highly flavoured small rice cakes ( I tried one), mini poppadoms also highly flavoured and, bizarrely, cardboard flavoured tortilla chips. And cartons of juice and bottles of water – to wash it down? The highlight was undoubtedly the cold hash browns cut into small triangles, the cold chicken nuggets (similarly bisected) and the cold sausage rolls – all served with some yellowish dip which had distressing edges (I don’t think any of us tried that) and some packets of tomato sauce. “Looks like the remains of a children’s party” said Rachel.